We decided last minute, on the advice of our friend William, to make a trip to Cartagena, also known as Cartagena de Indias! 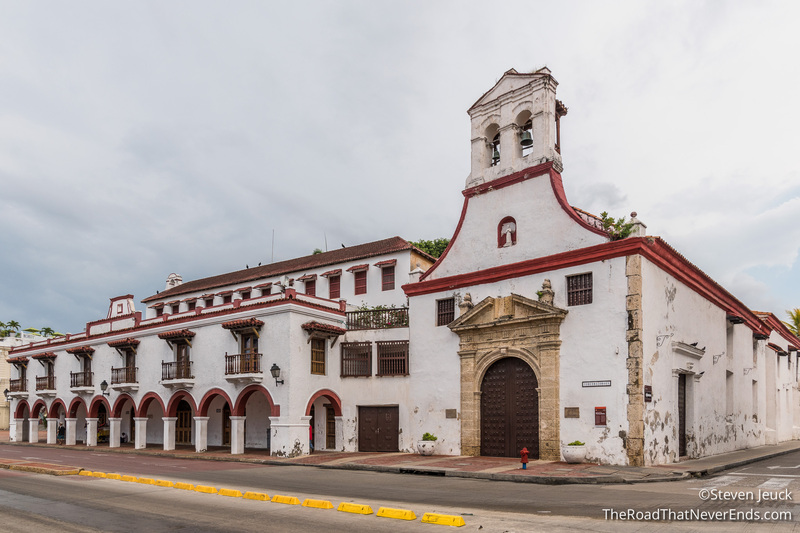 Located on the Eastern shoreline of Colombia, it has everything a port town has to offer: lazy days soaking in the sun, long nights dancing on the beach, tiny swimsuits, big smiles, and a fascinating history. We spent plenty of time relaxing, reading, swimming, and taking plenty of sun naps. Cartagena de Indias was named after Cartagena, Spain, founded in 1533. It is the 5th largest city in Colombia. Throughout its time under Spanish rule, Cartagena was a huge trade port, which included the slave trade. On November 11, 1811, Cartagena declared their independence from Spain, entering into a long and bloody war that coincided with other South American countries fighting for their independence. Símon Bolívar emerged as a hero, insuring freedom in 1820 for New Granada (now parts of Venezuela, Colombia, Panama and Ecuador). Cartagena is a popular port stop for various cruises, vacation spot for Colombians as well as an international destination. In 1984, the walled city and fort were designated a UNESCO World Heritage Site. Although humans have been living here since 4000 BC. the colonial influence is everywhere in the walled city. Walking through the streets, it feels like you are stepping back in time. From the airport, they usher those needing a taxi to a queue with a window. An employee asks you where you are going and prints a receipt with the amount. You hand it to the taxi driver and it’s that easy. Throughout the week, we were easily able to get a taxi to go anywhere. The taxis here do not have meters, instead, you negotiate the price before entering the cab. We didn’t have to do too much haggling as most of the drivers seemed to adhere to a semi-standardized pricing system. We had no problems with taxis or getting around – very easy. We decided it was time to splurge and enjoy our honeymoon by the beach. We were able to get a fantastic rate at Hotel Caribe located in the “new city”. Our hotel was lovely, and had beach access with chairs, an amazing pool, and the most comfortable king size bed (which people who travel abroad know how rare that is). We enjoyed every ounce of luxury offered. 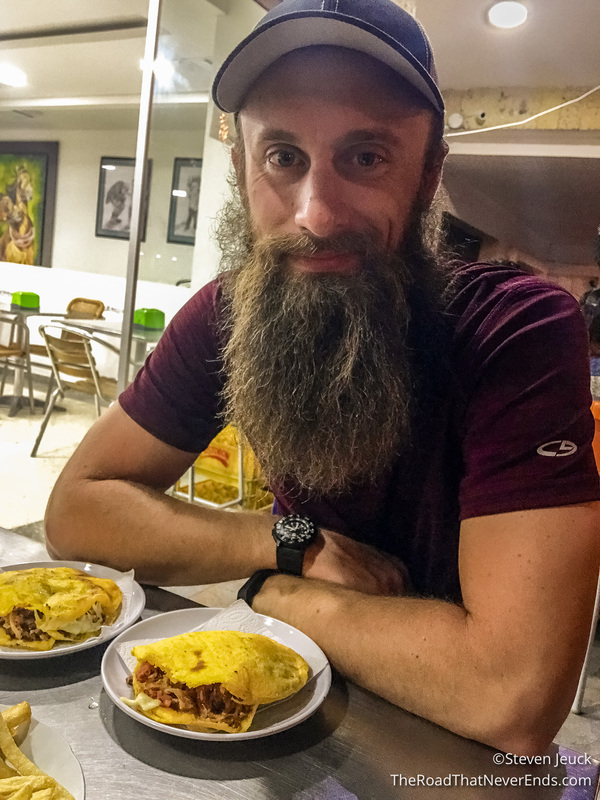 Hands down our favorite place to eat was Arepas Pues! Arepas are a popular cuisine in Colombia, served daily among different dishes. This restaurant serves it as a sandwich, split, stuffed with meats and cheeses. We loved it so much, we ate there twice. Steve fell in love with their homemade salsa, and their three meat combo. 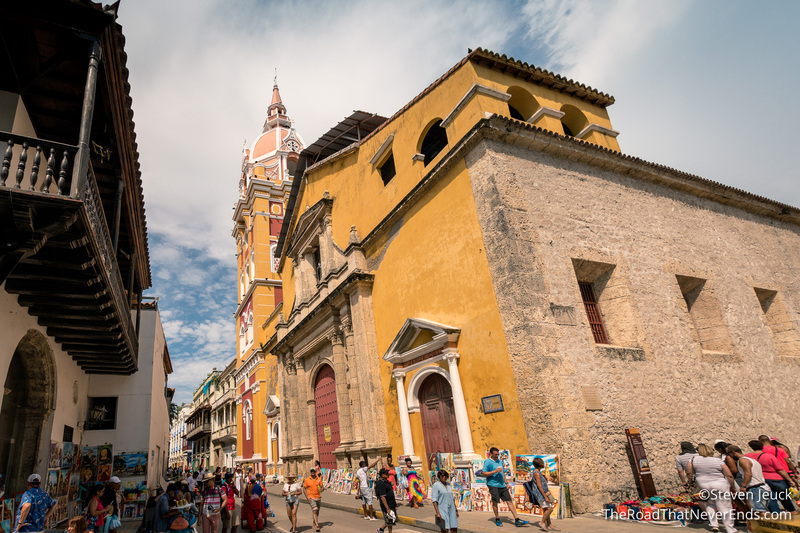 If you are in Cartagena – you must go there. 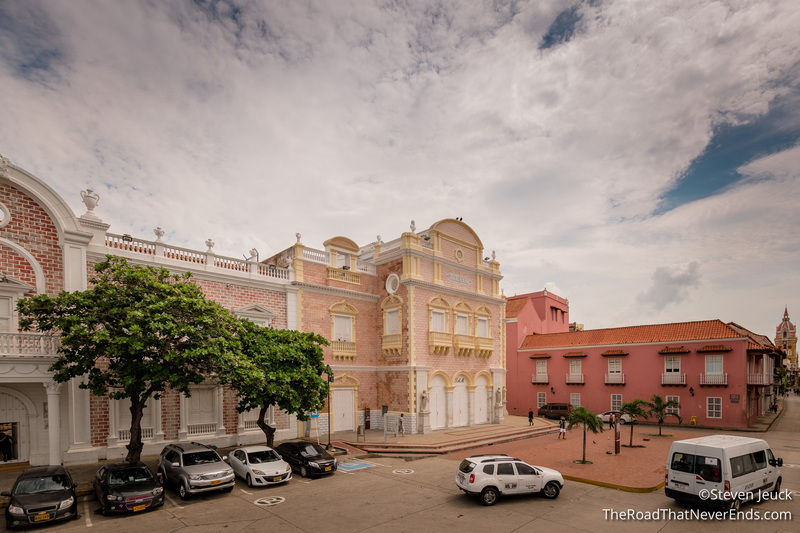 Plaza San Diego – In the 1750s, this land was a fruit orchard to the Governor Francisco Bahamón de Lugo. It laid between the Convent of San Diego (now a School of Fine Arts) and the nunnery of Santa Clara de Assisi (now a hotel). Iglesia de Santo Toribio & Plaza Fernández Madrid – The church of Santo Toribio was completed in 1736, and included a plaza located right outside the church. 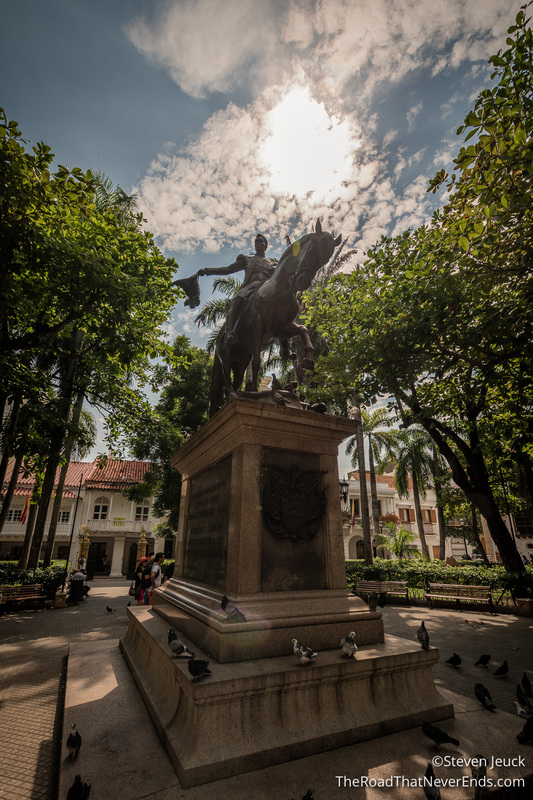 Plaza de Bolívar – This is considered the main park inside the walled city. This square is surrounded by the Cathedral of Cartagena, Governor’s palace, and the Palace of Inquisition. The park was named after “The Liberator” Símon Bolívar. Here you will find many street vendors selling food, drinks and goods. 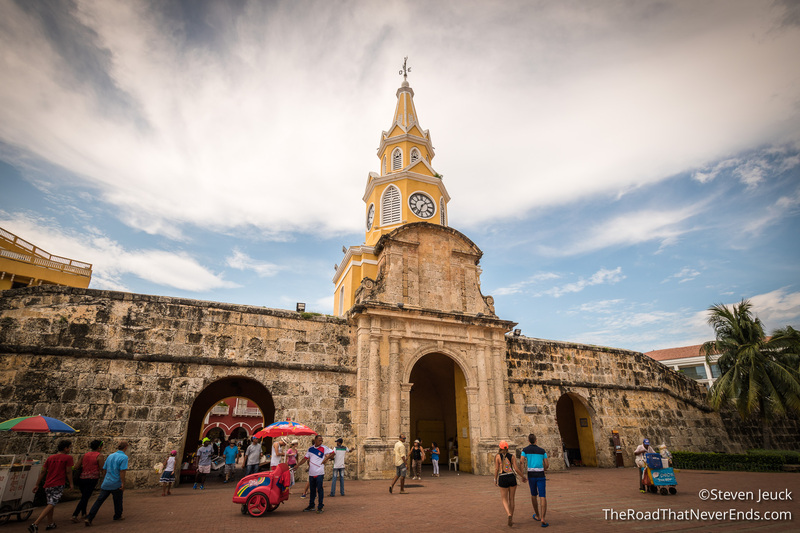 Torre del Reloj & Plaza de La Aduana – The clock tower was once the only entrance into the walled city. 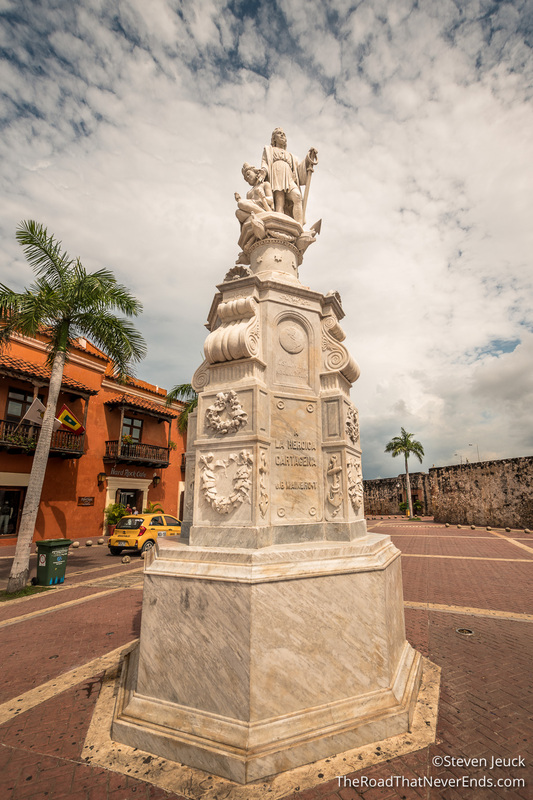 Once you pass through the gates you are in Plaza de La Aduana, where slave auctions took place. 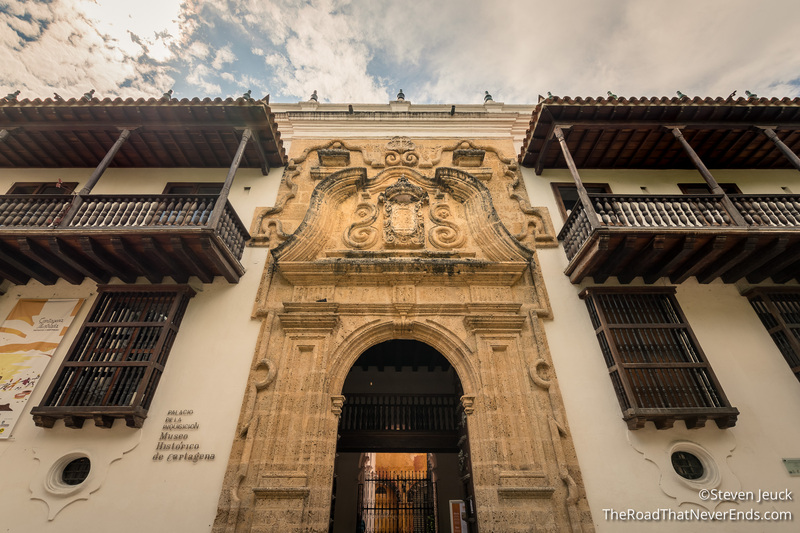 Convento Santo Domingo & Plaza de Santo Domingo – The church of Santo Domingo was built in 1539 and is the oldest church in Cartagena. The adjacent plaza is a popular amongst locals and tourists – restaurants, shopping and art, there is plenty to do. 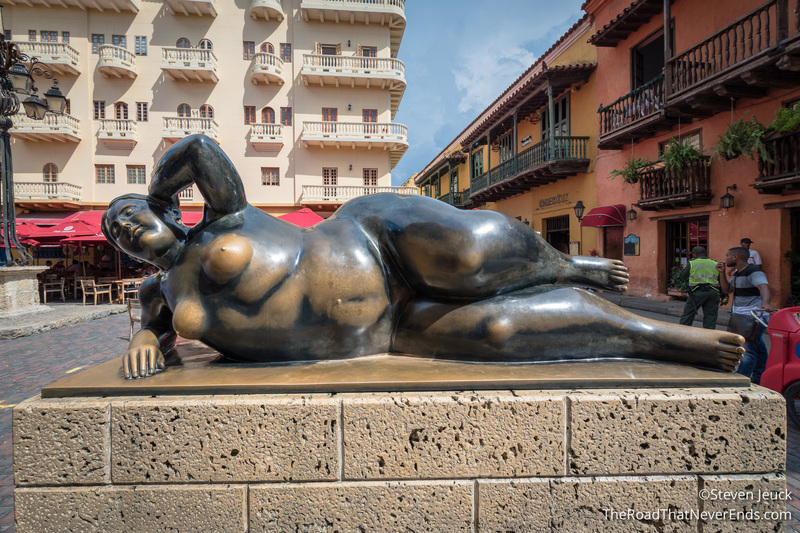 We even spotted one of Fernando Botero’s pieces in the plaza. 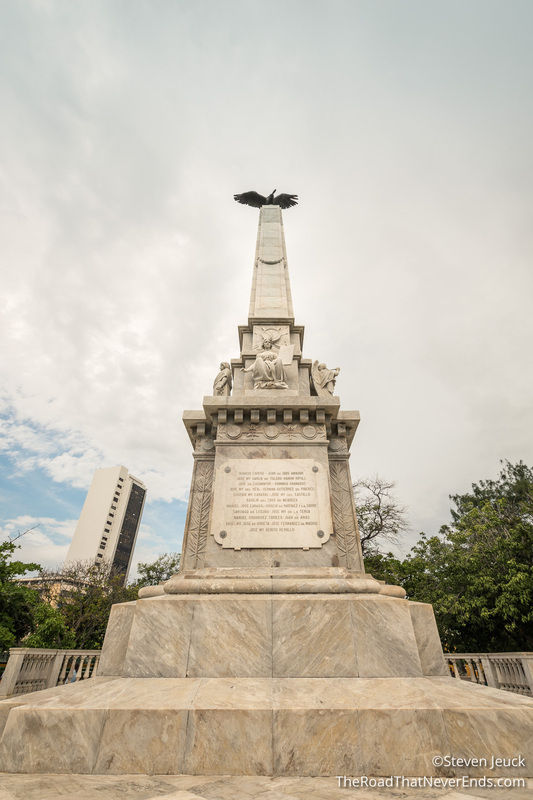 Parque del Centenario – The centennial park was created in 1911 to celebrate the Cartagena’s independence day, and honor the heroes of the revolt. The park was designed by Pedro Malabet and used the Luxembourg Gardens in Paris as his inspiration. Steve and I were slightly disappointed that the park was in desperate need of maintenance and a little sketchy even during the daytime. 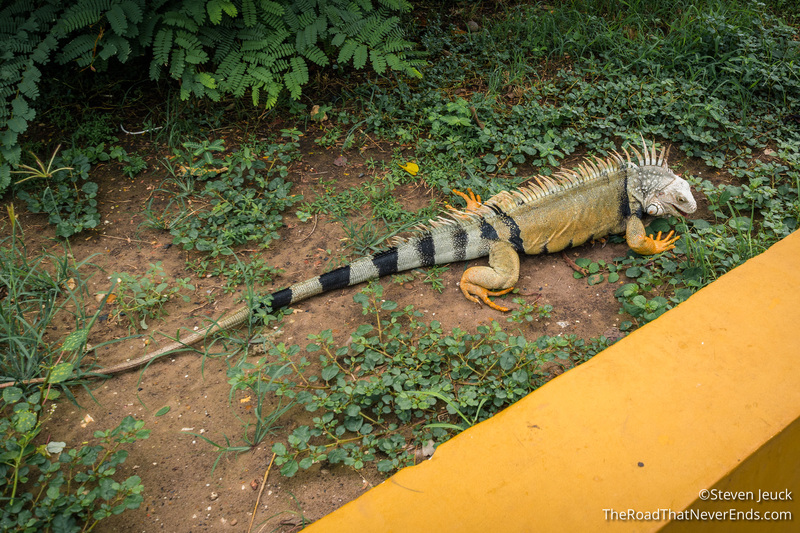 However, we were delighted to see iguanas roaming freely and happily throughout the park. 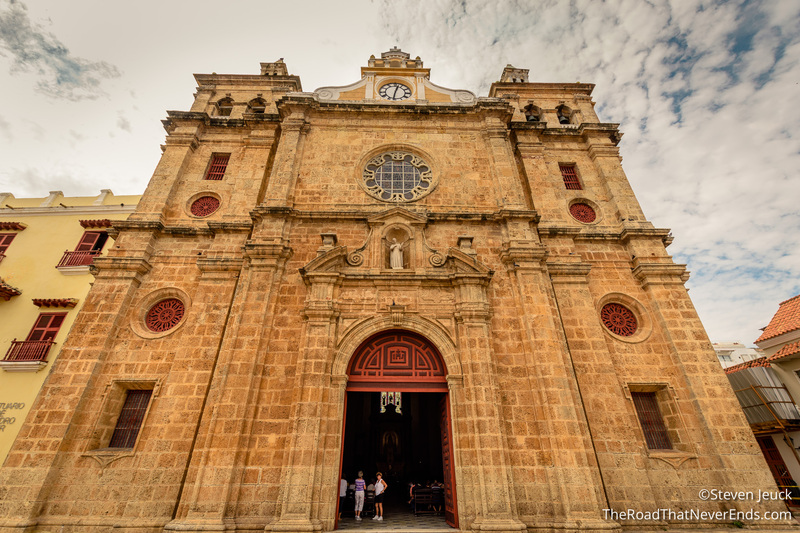 Catedral de Santa Catalina de Alejandría – The cathedral is officially dedicated to Saint Catherine of Alexandria. It was built in 1612. The most distinguished feature is the beautiful tower. 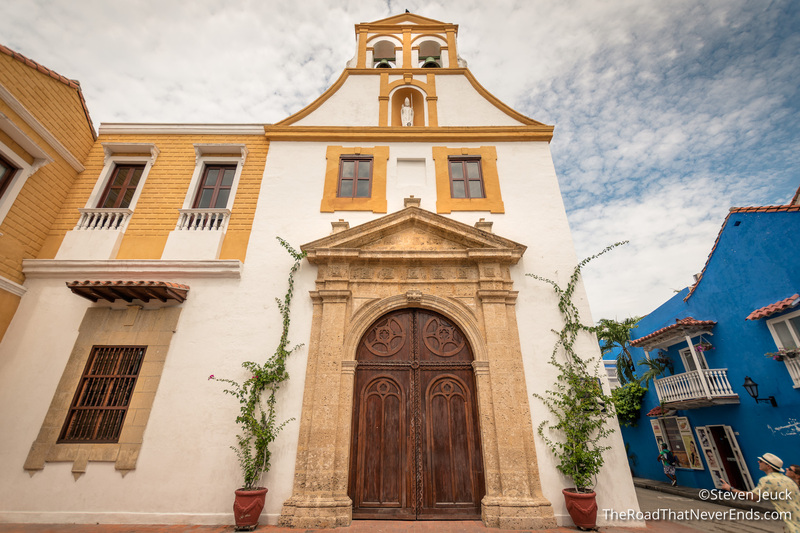 Iglesia de San Pedro Claver – This church was originally built in 1580, and rebuilt in the early 17th century, is one of the most visited churches in Cartagena. Famous for Saint Peter Claver, a priest who dedicated his life to the salvation of the African slaves, baptizing them in nearby gardens. Teatro Heredia – The Opera house was built in 1911, on the ruins of Church of La Merced. Since its opening, it has gone through several renovations, with it latest reopening in 1998. Palace of Inquisition – It was once the inquisition office, where hundreds of Jews and Non-Catholics were tried and executed. It serves now as a museum. 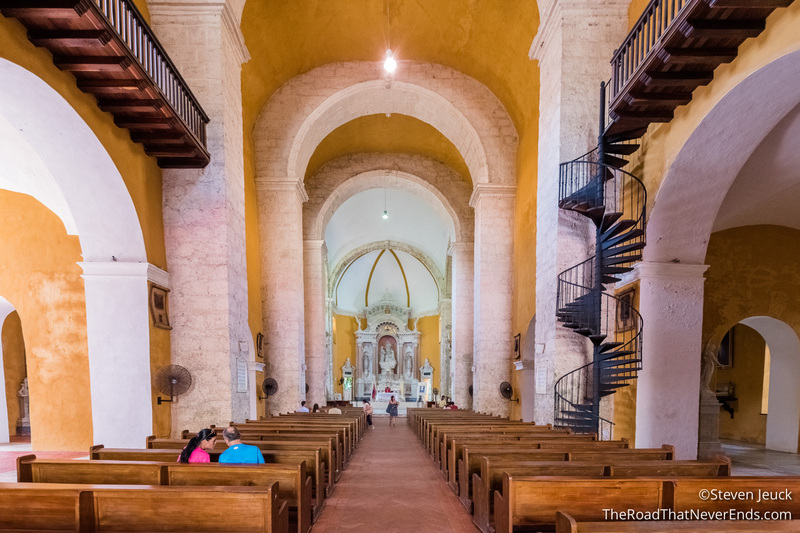 Iglesia de la Tercera Orden – Beautiful 17th century church, located just outside the walled city. 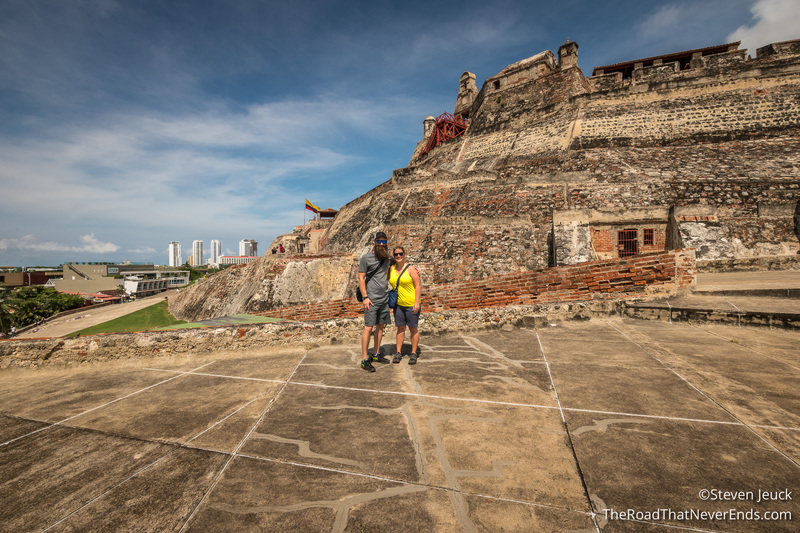 Castillo San Felipe de Barajas – This fort was originally built by the Spanish in 1536, and expanded in 1657. During its time, the fort saw two major battles: Raid on Cartagena (1697) and Battle of Cartagena de Indias (1741). We paid 25.000 pesos each to enter the fort, took a complimentary map and explored. 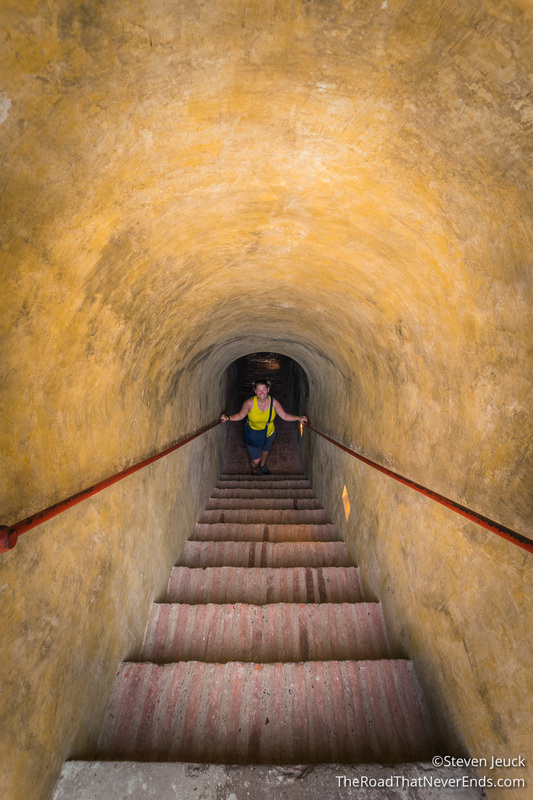 The fort provides great views of the city as well as entertainment as you explore the tunnels underneath. 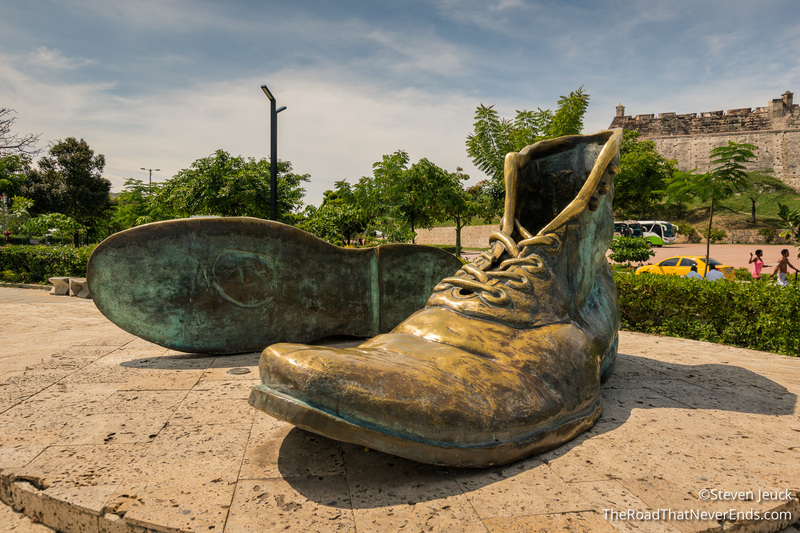 Monumento a Los Zapatos Viejos – This monument is dedicated to poet, Luis Carlos López, a Cartagena native. One of his famous poems, My Native City, is inscribed on the base of the monument. Bogota, Colombia!!! We can’t wait to explore the Capital District! Thanks for all the information! I can’t wait to explore next spring, if only for a day….sounds wonderful! Did you guys happen to do any walking tours of the walled city? If so, can you recommend it? Have a safe & great time continuing your adventure. Love the updates! Hi Gayle! You are going to love it. We didn’t do any walking tours, Just on our own. Our hotel gave us a map with everything on it. It took us about 2-3 hours. Like most major cruise ports, there are a lot of people pushing to sell you stuff. We had to get say “no gracias” a lot. Also, there are taxis claiming to take you to your boat for $5, when in reality they are way over charging. We took a taxi farther for only a few bucks.